louisgray.com: Who Cares About LeBron? 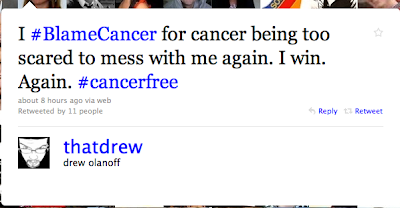 Drew Is Cancer Free! Drew Wins Again. Eat It, Cancer. Tonight, as former Cleveland Cavalier LeBron James was making his announcement on ESPN that he was headed to play hoops for the Miami Heat, I like many other people, had the TV on to see what he would say. But I had the set on mute, as I was on the phone with my good friend Drew Olanoff, who got better news today than any Miami Heat fan. After a serious scare that had his friends and family worried he was setting up for a second round to fight cancer, he got a call today giving him the all clear, meaning instead of months of chemo, nausea, fatigue and worry, he gained a reprieve. While I may at times seem detached and automated, and focused on tech, and while many people aren't seeing the real, true, social connections that can happen from the more virtual concepts of networks, "friends" and connections, I can verify they are real, with Drew being among the most clear connections I have gained from this Web experience. Despite our differences, Drew makes sense to me, and he is a close friend of my entire family, and hopefully, I am to his. I've talked to you about his challenge with Hodgkin's Lymphoma that consumed much of his 2009. I told you about his starting a new phenomenon called BlameDrew'sCancer, which later morphed to BlameCancer, when he first kicked cancer to the curb. And in recent weeks, we morbidly talked about having to start a new domain name of blamedrewscanceragain.com and preparing for a much tougher fight. I had mentally resigned myself to the expectation that cancer was going to challenge him again, and that a fight was inevitable. I know he did too. But today, on top of all the other news out there, from global issues, to jury verdicts and choices of well-paid basketball icons, there was really only one piece of news that mattered. A friend of mine and to the tech community at large is going to be with us, at full strength. The Web needs Drew, and so does my family. So cancer, please go away and don't come back. We're done with you.